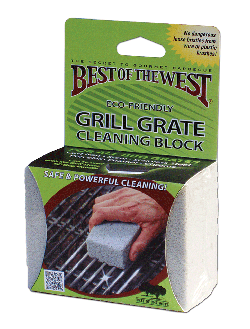 Best of the West Grill Grate Cleaning blocks are powerful effective and safe cleaning for BBQ grills, griddles, smokers and other cooking surfaces. Safe and powerful cleaning for porcelain, enamel, cast iron, stainless steel, chrome, or any and all BBQ Grates. Each one saves the equivalent of one glass bottle from being added to landfills. This contributes to a healthy environment.